Our comprehensive startup guide walks you through all the essential steps you need to take to make your group a successful independent entity! The PTO Startup Toolkit includes information on how to get organized, incorporating your group, applying for nonprofit status, writing bylaws, and filing for tax-exempt status with the IRS, including a step-by-step guide to completing IRS Form 1023-EZ. Did you know that PTO Today Plus members get all our toolkits as part of their membership? 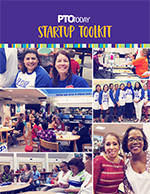 If you’re a Plus member, you can download the complete PTO Startup Toolkit right now. To learn more about Plus and all the benefits of membership, including access to all eight of our expert guides (retail value $332), visit PTOtoday.com/plus. Why Become an Official 501(c)(3) Organization? How Can Your Group Become Official? Appendix A: Are You Covered? Do We Really Need Insurance? Which Policies Should We Purchase?